Eva Laila Hilsen is a graduate of the National Academy of the Arts in Oslo. She is a member of Association of Norwegian Graphic Artists, The Association of Norwegian Painters, The Drawing Art Association of Norway and The Association of Norwegian Visual Artists. Eva Laila Hilsen made her debut in 1987 with the exhibition Under Way in Bodø Arts Society. Since, there have been more than forty exhibitions of her work in private and public galleries, nationally and internationally. She has participated in a serie Read Mores of group exhibitions nationally and internationally, including Norwegian Paintings, Statens Høstutstilling (National Autumn Exhibition), Øst- og Vestlandsutstillingen, Norge (Eastern and Western Norway Exhibition) and Trøndelag Exhibition. 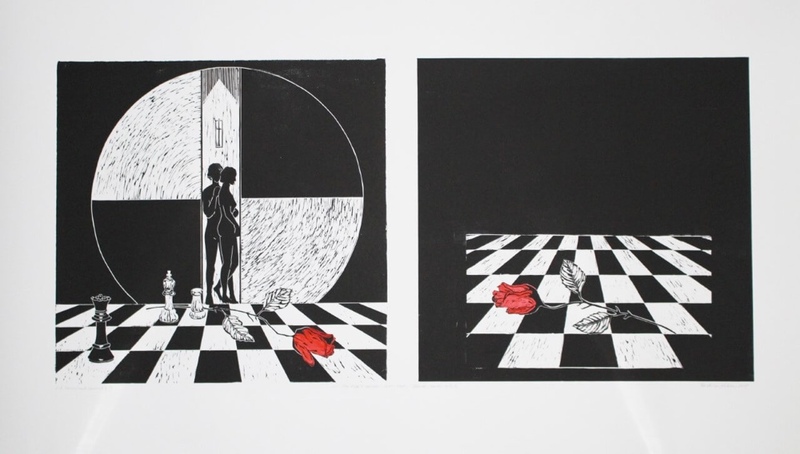 Graphic art Biennales and Triennials in Italy (IV International Small Engraving Exhibition, Cremona - Premio Leonardo Sciscia amateur d'estampes, Milano - Premio Internationale Biella Per Licisione, Biella.) Brazil, Canada, Egypt, France, Finland, Lithuania, Poland, Portugal, Ukraine, Yugoslavia. In 2009 she took part in the 5th International Artist’s Book Triennial Vilnius, Lithuania. Her work has been exhibited at the Pleiades Gallery in New York, and she participated with an installation in a German garden project in Darmstadt “KlangARTen”. Lately she had a solo exhibition in South-Africa and Paris.